The Indian Air Force's planners and crews operating in Kargil are handling the special challenges of high-altitude air operations. IN recent weeks there have been numerous reports of outstanding victories by valiant Indian jawans who regained control of significant peaks in the Kargil sector from Pakistan Army infiltrators. There are also reports of the successes of the Indian Air Force (IAF), which is causing damage to the enemy's emplacements, infrastructure on the hills and stocks of food and ammunition, flying over difficult terrain and hostile heights. Before discussing the IAF operations, it is important to understand the conditions in which the aircraft fly. As they move through air, the flow over the wings (of the planes) and over the rotor blades (of helicopters) provides a lifting force to support the craft in the sky.  At high altitudes, the air density is lower than what it is at lower heights, for which the planes are designed. Consequently, in the rarefied atmosphere, for the same forward speed the corresponding lifting force is reduced. The terrain in and around Kargil is between 4,572 metres and 5,486 m above sea level. The aircraft are, therefore, required to fly at altitudes of about 6,100 m. The density of the air at these heights is roughly 30 per cent less than that of the air at sea level. This causes a reduction in the weight that can be carried, and also the pilot's ability to manoeuvre as the radius of a turn is higher here than at lower levels. Also engine performance deteriorates with altitude, as for the same forward speed a smaller mass of air goes into the jet engine of the fighter or the engine of the helicopter, compared to low altitudes. The airfields nearest to the targets in Kargil are the Srinagar air base and the neighbouring military airfield at Avantipur. Therefore, the IAF has to operate primarily from these two bases. According to media reports, the fixed-wing planes being used for ground attack are mainly the single-seat MiG-21s and MiG-27s. The MiG-21 is the older type of jet fighter, built mainly for air interception with a secondary role of ground attack. Its avionics and weapons are of 1970s vintage. However, this jet fighter can carry one tonne of bombs or four pods of rockets in addition to its 23-mm cannon. It is capable of operating in comparatively restricted spaces, which is of importance in the Kargil terrain. The swing-wing MiG-27 is an airplane optimised for attacking targets on the ground. It can carry a load of roughly four tonnes, which could be a mix of various weapons, including a 23-mm cannon, rocket pods, multiple carriage free fall bombs of various weights and varieties (for example, the MiG-27 can carry 18 bombs each weighing 100 kg in addition to a 23-mm multiple-barrelled cannon), retarded bombs and smart weapons. It has a computerised bomb sight, which enables accurate weapon delivery. Its variable geometry wings are kept forward at 14o sweep for take-off and landing, and whenever required to fly at slow speeds. The other two sweep-back positions are for combat and for high-speed getaway. 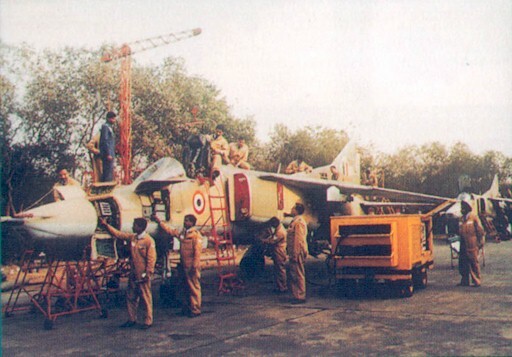 The MiG-27 is, therefore, ideal for the high altitude and mountainous terrain of Kargil. A very busy Srinagar AFS during the war. The state-of-the-art Indian Mirage-2000 planes conduct electronic warfare, reconnaissance and a few sorties of ground attack, for which a great deal of accuracy is needed, using the 'smart' weapons that this plane can carry. Because of the need to engage Pakistani targets in the valleys and on ridges, the slower helicopter gunship became a critically important requirement. The Mi-17 was hence modified to carry four rocket pods on external pylons. Each pod has a capacity of 16 or 32 air-to-ground rockets. This helicopter is proving very effective in engaging Pakistani bunkers and troops although one helicopter and its four crew members have been lost to a U.S.- made Stinger surface-to-air heat-seeking missile fired by Pakistani troops. It is understood that the Mi-17s being used in Kargil are also being fitted with additional safety features in order to protect the air crew. It is a pity that the infra-red flares, which the helicopter can carry and release to decoy heat-seeking missiles, were not imported. The other helicopter in use is the Cheetah. The agile, light and small Cheetah is used to stay outside Pakistani gun range, locate enemy targets and direct artillery fire onto Pakistani targets. It is also used as an airborne Forward Air Controller (FAC) to guide Indian fighters to the targets. In the high mountains, air crew face some difficulties in carrying out their operational missions. As aircraft performance is lowered in the rarefied atmosphere, pilots have to be very careful while flying in the valleys. The larger radius of turn reduces their ability to manoeuvre in the restricted width of the valley. It also increases the height lost in a pullout from a dive attack. Hence the pullout has to be initiated at a greater height. Therefore, the weapon release heights have to be raised correspondingly. This may cause inaccuracies in the aiming of weapons. The non-standard air density also affects the trajectory of weapons, which has been calculated for sea-level firing. The firing hence may not be accurate. In the mountains, be they in the valleys or on the ridges, the targets are relatively small, spread out and difficult to spot, particularly by high-speed fighter jets. This becomes worse in low visibility conditions or when there is clouding en route or over the target. The operations restricted to just the Kargil area do not lend themselves to the classical use of air power. There is also the major constraint of the political requirement of not crossing the Line of Control (LoC). The IAF is, therefore, not at liberty to use large strike formations with an appropriate weight of attack to destroy the Pakistani supply lines and logistic bases and training camps. Such attacks are needed in order to reduce the pressure on the Indian Army and to obviate the use of these facilities in the near future too. Also, under conditions of large radius of turn because of the thin air and the small and spread-out nature of the targets in the mountains, it becomes difficult not to transgress the LoC unless the direction of attack is parallel to the LoC. The terrain configuration and the location of the target may not always make it possible. These are some challenges faced by IAF planners and crews operating in Kargil. However, one learns to overcome these difficulties and find solutions with ingenuity, determination and practice. The IAF regularly exercises its fighter squadrons in high-altitude operations and has an air-to-ground firing range for practice in Ladakh. It needs to be noted that the IAF is the only air force in the world that carries out war operations in the mountains at such high altitudes and in such difficult terrain as in the Kargil area near the LoC. Crews of the IAF, the modern-day gladiators, are second to none in dedication, combat-worthiness, grit and professionalism. On a typical day of operations, if the first few missions are to be on target at first light (20 minutes before sunrise), the pilots report to their fight offices about two hours before the Time On Target (TOT). After a short medical examination by the unit doctor and after changing into their combat flying kit, they are briefed on the weather at the base, at the alternative airfields and in the target area. They are told about the results of the previous sorties and given the latest intelligence reports. The Fight Commander then tells them about the specific target, the composition of the force, the weapons to be carried and the TOT. The Ground Liaison Officer (GLO), generally an Army officer, gives the latest Sitrep (Situation Report), details of the strike demand from the Army, radio call signs of the FAC in the target area and a detailed target description with photographs, if available. The pilots then pencil the route on their maps, calculate the transit time to the target, and thus the time of take-off. The take-off time is conveyed to the ATC and to the GLO. The ATC coordinates the mission with the rest of the expected air traffic and the GLO conveys the TOT to the Army formation and the FAC in the target area. The formation leader then briefs the other pilots in the strike mission with regard to the relative positions to be flown by each aircraft in the formation and the tactics to be adopted. The pilots have a quick cup of coffee and biscuits or sandwiches and proceed to the airplanes. with the help of a small crane. In the meantime, technicians carry out pre-night checks and inspections on the planes to be flown, refuel them and charge oxygen. The armourers load the ammunition, rockets, the infra-red decoy flares and any other ordnance that is required to get the aircraft ready for the mission. When the pilots arrive, the ground crew strap them up in the cockpit. In the technology-intensive world of military aviation there has to be close teamwork among the pilots, the technicians, the ATC controllers, the GLOs, the administrative and logistic personnel and so on. This close teamwork and interdependence creates a visible and strong camaraderie among them. Regardless of how brave the pilots are, before a mission they tend to lose their appetite and sense of humour, and no amount of water quenches their thirst. However, once they get busy with the pre-night cockpit checks, the fear of the unknown is forgotten and professionalism and peer pride take over. The pilot is then busy and businesslike. On his return from a trip, the appetite and humour are back. On returning from a mission, pilots debrief each other. They are then debriefed by the GLO and the Fight Commander on what they had seen at and around the target area, about the damage inflicted on the enemy and if, in their view, there is further need for attacks on the same target. After each mission a new and a bigger picture about the enemy emerges. This is transmitted to the Army and the higher formations of the IAF. This new information also becomes part of the intelligence briefing for subsequent missions. In the meantime, the pilots of the next formation absorb all available information and stand by for their mission. The next team of gladiators is ready. 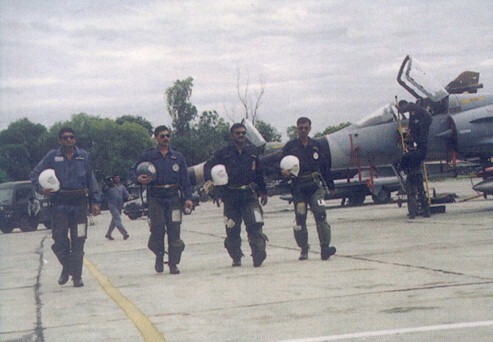 A fighter pilot, Narendra Gupta recently retired in the rank of Air Vice-Marshal. He saw action in the 1971 air operations, particularly in the Battle of Longewala in the Rajasthan sector.